Daily Dose: Why can't it be? 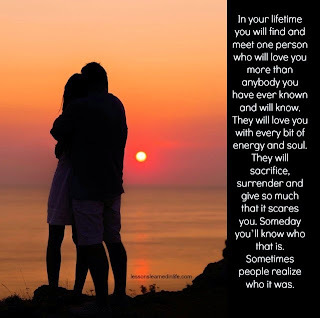 "In your lifetime you will find and meet one person who will love you more than anybody you have ever known and will know. They will love you with every bit of energy and soul. They will sacrifice, surrender and give so much that it scares you. Someday you’ll know who that is. Sometimes people realize who it was." I always pester God about my earthly desires. And one those is my love life. I still do not know if I am making progress in accepting things as they come to me. I would like to think that I am doing so. As I reflect on the quote above, I feel that I am that one person who is loving someone. I am praying that he will realize it soon while I am still feeling it. Maybe he already knows and just ignoring it. I always pray to God that if we are not meant to be, remove the feelings that I have for this person. It is almost one year since then. It is really painful on my part. But if he also has feelings for me, it is more painful and complicated for him. I can only wait until the feelings are gone (if it is even possible) and of course pray, and pray harder. Quoting Bill Hybel, "Before bringing a request to the Lord, it's a good idea to ask: If God granted this request, would it bring glory to him? Would it advance his kingdom? Would it help people? Would it help me to grow spiritually? ", I want to stand firm and reason to God that "Yes" is my answer to all of the questions. But God's reply is otherwise. If the request is wrong, God says, "No." If the timing is wrong, God says, "Slow." If you are wrong, God says, "Grow." Now I ask God and myself, "When will it be right when it comes to my heart...?"